May 3rd and 4th were the dates for this year’s 30th annual edition of the Great Smoky Mountains Birding Expedition. This trip began in 1984 as the brainchild of George Ellison, Bryson City resident, author and naturalist, Rick Pyeritz M.D., who had a practice in Bryson City before he became medical director at University of North Carolina Asheville and Fred Alsop PhD, field guide author and ornithologist at East Tennessee State University. Regular readers of the “Naturalist’s Corner” may recall that last year we set a new record for the annual GSMBE with 116 species. We shattered the old record of 109. Well this year we didn’t quite reach 116, but we still bested the old record winding up with 113 species. While last year was record-breaking, this year may have actually been a better representation of what this expedition is all about. Last year the weather, especially on Saturday, created pretty tough birding conditions. But we were finding birds, thanks largely to the expertise of Alsop and Pyeritz, so we marched on through damp and chilly – to a deluge at Kituwah (formerly Ferguson Fields) adding to the list. This year the weather was almost everything one headed outside could ask for – unless you were a birder and could do with a little less wind – clear skies and mild temperatures. And we were also getting good numbers of species. The difference was, with the good weather we lingered longer at stops. And that patience paid off with outstanding views of different species. At Collins Creek Picnic Area in the Great Smoky Mountains National Park most of the group were treated to up close and personal views of a beautiful “fire-throat” – blackburnian warbler. And at one overlook on the Blue Ridge Parkway we had an orange variant scarlet tanager and a “normal” scarlet tanager together in the same view plus a very cooperative chestnut-sided warbler. During the day, many people also got outstanding looks at indigo bunting, blue grosbeak and orchard oriole. When the GSMBE began, the area we now know as Kituwah (the Mothertown of the Eastern Band of Cherokee Indians) was a diary farm known as Ferguson Fields or Governor’s Island. In that old state there were sludge ponds and a greater extent of wetlands that often produced a number of shorebirds. There has always been a running battle at Kituwah/Ferguson Fields between man and nature. The area, which is adjacent the Tuckasegee river, historically harbored a lot of wetlands – the move to agriculture was a move to dry the property. If it weren’t for beavers that move would have likely been accomplished years ago. But beavers are nothing if not tenacious (maybe OCD.) And, largely thanks to beavers, there remains a small wetlands on the property. This year, it looked like the farmers had won. Beaver dams were gone and the canal (ditch?) from the wetlands to the Tuck was basically dry. But nature abhors a vacuum – and there in the middle of what could best be described as a puddle were one greater yellowlegs, two (at least) solitary sandpipers and four western sandpipers. Sunday was a teaser with some great early finds, like Tennessee warbler, bay-breasted warbler and Swainson’s warbler. 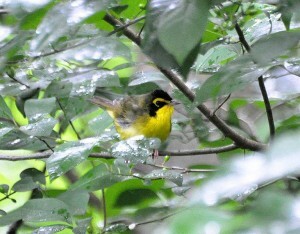 And for those committed “second-day” birders, outstanding looks at a Kentucky warbler.